Raphael is a dumpsite boy. He spends his days wading through mountains of steaming trash, sifting it, sorting it, breathing it, sleeping next to it. Then one unlucky-lucky day, Raphael's world turns upside down. A small leather bag falls into his hands. It's a bag of clues. It's a bag of hope. It's a bag that will change everything. This book was totally different from anything else I have read so far this year. It hit on a variety of topics which made me think and was generally a nice read. 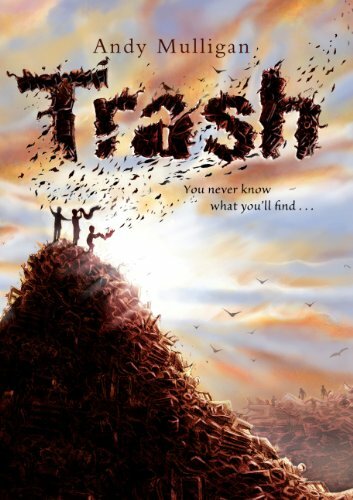 The story was told from the point of view of three boys (along with occasional commentary from other secondary characters) who live and work in trash, namely the city landfill site. They make their living from wading through the rubbish thrown out by the people in the city they live in. The first thing that really struck home for me whilst reading this was how this was in fact normal life for a huge number of people which really hit home with me and possible the main reason why this should be a more widely read book. The fact that there was a free school on site which the children didn't use just highlighted how poor these people were. The main thrust of the story is a mystery based around a bag found by the boys one day which as it unravels throws up a great deal of moral questions about poverty, police and statement corruption and the ever growing divide between the world's most rich and the world's most poor. The story goes along quite nicely and ends with a Robin Hoodesque morale to the story. In truth I didn't find it the most engaging story nor did I think the ending fit with the story as a whole. Certainly a book with a moral conscious which if nothing else makes it one you ought to read but do bear in mind it is probably aimed at younger readers as the story is quite straight forward and predictable.